“If you want to go fast, go alone; if you want to go far, go together.” African Proverb. I first went to Nepal, by myself, just six months after the earthquake in 2015. The lodges were almost empty along the Annapurna Base Camp trek. In Gandruk, my tea house had 42 beds, but only three tourists. Didi, my host in Chomrong, asked me to please bring friends on my way back down the mountain. I brought two and we all enjoyed her chocolate cake. Flying home, I sat next to a gentleman who was working in the non-profit sector and he commented how important it is, in his work, to notice what people don’t need rather than just assume their needs, if we really want to make a substantial and sustainable impact. This trip, Angel and I came together and we climbed higher, but our reach went even farther, thanks to Pack for a Purpose. The key here is needed supplies. As independent travelers, not already affiliated with any tourist agency, we had four organizations with whom we could participate in Nepal, two of them in Kathmandu. Each had a slightly different list of supplies, to support their needs. 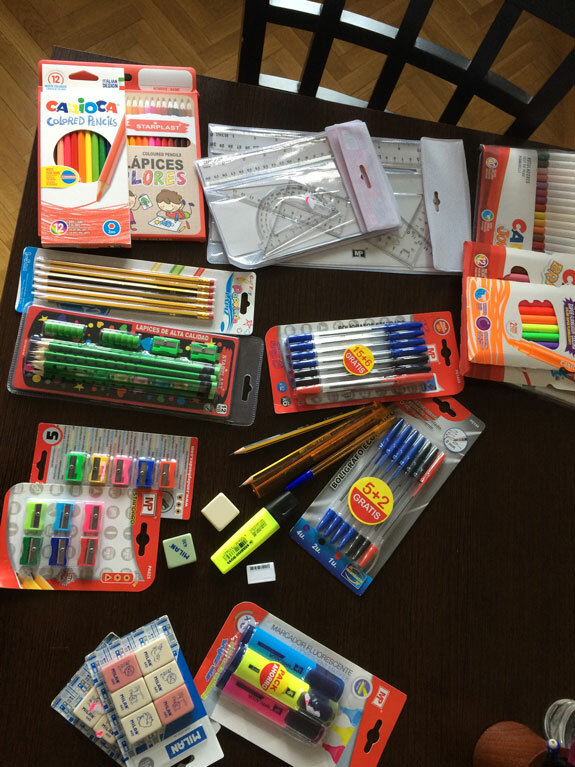 We collected: colored pencils, erasers, handheld pencil sharpeners, markers, pencils, pens, protractors, and rulers. Be sure to check the website for the most current requests. 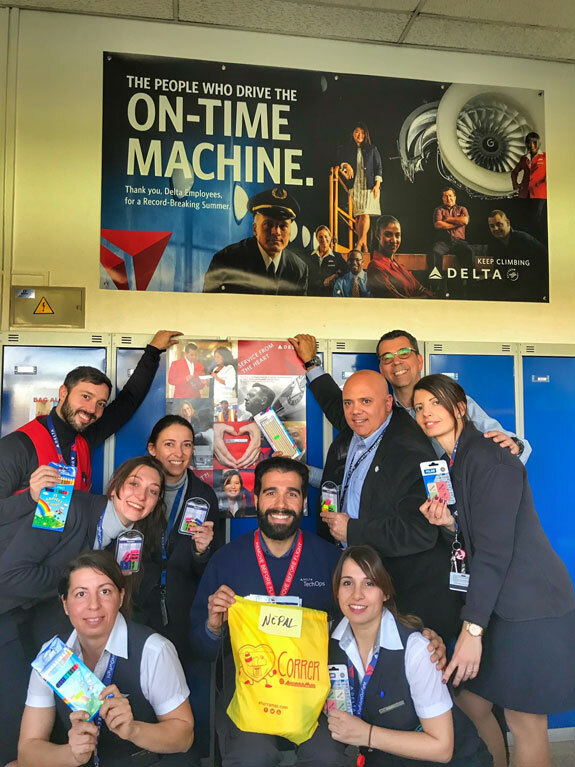 All of the supplies were donated by Angel’s Delta Air Lines colleagues in Madrid and by my English students. 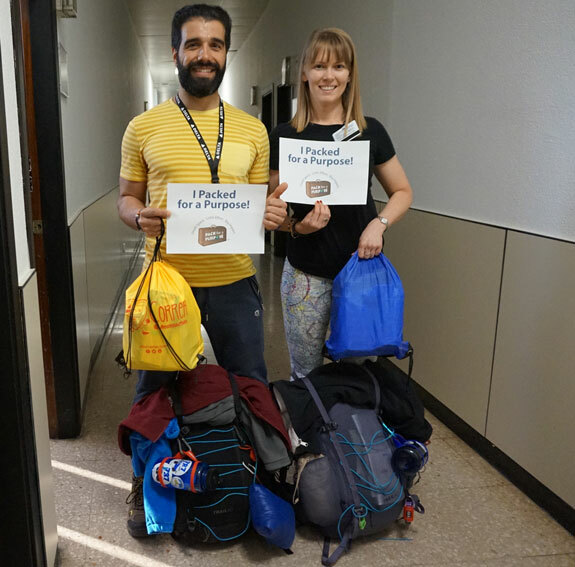 We were traveling standby, or space-available, so we could not guarantee that any checked baggage would arrive at the same time as us to our destination. So we packed them into two drawstring sacks and carried them onboard our flights, as personal items, from Madrid to Istanbul to Kathmandu. We coordinated a meeting and the delivery of the donations with Shreehari, the CEO of Trekking Team Group. He graciously met us in his Thamel office and took the time to explain his company’s corporate social responsibility and the current political and socioeconomic issues at play in Nepal. With the help of a German organization, his company has been able to improve a village school with donations, like ours, as well as provide drinking water, bathrooms, uniforms, backpacks, a dental clinic, and a cooking stove, among other projects. 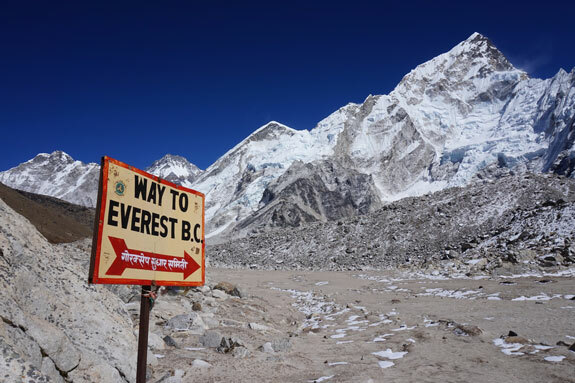 Angel and I climbed into the mountains of Sagarmatha National Park to Everest Base Camp knowing that a group of children were a little better equipped to learn and grow. Looking up at the peaks, we felt so small, but we knew that we could still make a difference. A month later, Shreehari traveled with a larger group to the village school outside Kathmandu and delivered our donations and many more. He emailed us the photos of the children who had hand-written thank you notes with our names. We’ve shared the photos with our colleagues and students who contributed to the donations and with our online community at alphacharlietravel.com where we transport ideas that educate, inspire, and provoke meaningful impact in local communities around the world. We look forward to continuing to contribute to Pack for a Purpose on our future travels and encourage others to do the same. We will start where we are, in Madrid, as volunteers with USA Girl Scouts Overseas. As the girls prepare for their summer travels, we will brief them on the mission and process of Pack for a Purpose and encourage the girls to create their own mini project by researching their travel destination, collecting donated supplies, and then sharing their experience with their troop. Thank you to Rebecca and her team at Pack for a Purpose and to Shreehari and his team at Trekking Team Group in Nepal. And thank you to all of our colleagues and students who contributed. You all made our trip infinitely more valuable, but more importantly have selflessly given to those in need. Namaste.